The following fund is another top rated Morningstar and top S&P mutual fund. 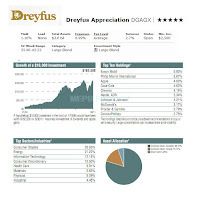 This Dreyfus Appreciation Fund is part of large blend US Domestic Stock fund. More details about this fund review can be found below. 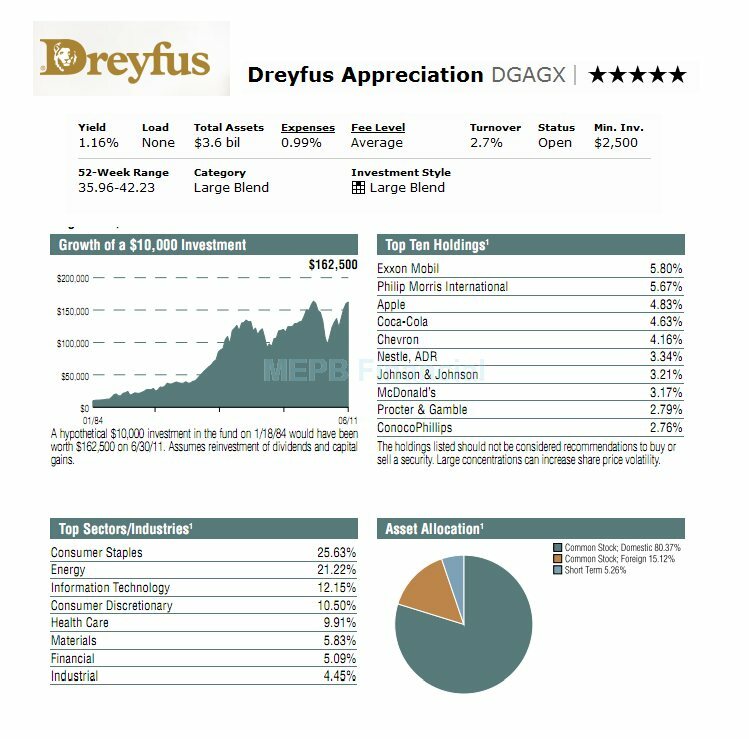 This Dreyfus Appreciation fund seeks long-term growth consistent with the capital preservation. It also tries to provide current income as secondary objective. This US Stock fund invests >80% of net assets in common stock. It focuses on blue chip companies with total market capitalizations of >$5 billion at the time of purchase, including multi-national companies. This domestic stock fund employs a "buy-and-hold" investment strategy, which is an investment strategy characterized by a low portfolio turnover rate, which helps reduce the fund's trading costs and minimizes tax liability by limiting the distribution of capital gains. This DGAGX fund has been managed by Fayez Sarofim since its inception in January 18, 1984. This fund is in the Large Blend category. It has dividend yield of 1.16%. The total net assets of this Dreyfus fund are $3.6 billion. The annual expense ratio of this fund is lower (0.99%) compared to the average in the Large Blend category (1.14%). Morningstar gave this large blend fund 5-stars rating for its 22 years of positive return. It was first introduced to investors about 26 years ago. The best 1-year total return of this fund was achieved in year 1998 with 30.85%. While the worst 1-year total return was in year 2008 with -32.37%. Based on the load adjusted return, this top rated mutual fund has returned 5.50% over the past year, 0.73% over the past 5-years and 2.70% over the past decade. The 3-year beta is 0.86. Investor can start investing in this Dreyfus fund by opening a brokerage account with minimum initial investment of $2,500 or $750 for IRA account. This is a no-load fund, so there will be no front-end sales load fee. There is as well no 12b1 fee for investing in this DGAGX fund. Investor can purchase this fund from a wide range of 112 brokerages. Please check with your brokerage for details. The top 10 stock holdings of this fund as of August 31, 2011 are Exxon Mobil (5.8%), Philip Morris International (5.67%), Apple (4.83%), Coca-Cola (4.63%), Chevron (4.16%), Nestle, ADR (3.34%), Johnson & Johnson (3.21%), McDonald’s (3.17%), Procter & Gamble (2.79%) and Conoco Phillips (2.76%). The top five sectors or industries are Consumer Staples (25.63%), Energy (21.22%), Information Technology (12.15%), Consumer Discretionary (10.50%) and Health Care (9.91%).